Up until the late 1920’s golf was always played and scored on a stroke play basis, where every shot is recorded based on the rules of golf laid down by the R & A. Professional tournaments around the world still use this format for competition. This is why when you watch a ranking event the scoring is based on the par for the course. So a player will be trying to go round the course in as few shots as possible. Once you understand the scoring you may want to improve your golf swing, to impress your playing partners and crush your scores click here for some proven techniques. This is a great way of playing golf if you are a proficient player, but can be soul destroying if a beginner or novice. Losing a ball on the first or second hole can leave you in despair for the rest of the round and even create further turmoil as you push your shots to try to make up the deficit. For more tips on driving straight click here. 1 Helping to speed up play. Helping to speed up play. In 1931 an avid golfer by the name of Frank Stableford who was a doctor in Liverpool recognised this problem and devised a new form of scoring which is widely used and accepted at club level today. 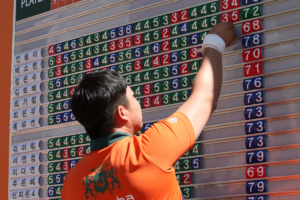 The system is based on points scored, which relieves the pressure on a player as they can pick their ball up if there is no chance of scoring on that particular hole. Tips on golf etiquette from PGA. The first competition to incorporate the new Stableford rules was played at Wallasey & Liverpool golf club in May of 1932. Such was the success of the new format that word spread quickly and the new way of playing has been universally recognized. I would point out that this system should not be treated as a cop out of the main stroke play method but a format of play to build confidence, increase the speed of play, and raise enjoyment of the game for all standards of player. A rangefinder will give you accurate distance. As the title of this article suggests I will explain the Stableford scoring based on a player with a handicap of 24, so other handicap levels can adjust accordingly. The principle of scoring is opposite to stroke play; in as far as the player who has accumulated the most points at the end of the round is the winner, rather than stroke play which is based on the lowest score. Further advice here on avoiding being called a slow player. When looking at the scorecard of the course you are playing, you will note beside each hole is the stroke index which is numbered by perceived degree of difficulty, with stroke 1 being the hardest up to 18 being the easiest. A 24 handicap player would receive a shot on every hole plus a further shot on stroke index 1 to 6. Making a total of 24. Points are scored on the basis of 2 points for a par, so consequently, a player would score 3 points for a birdie, which would be 1 under par, and 2 under par would be rewarded with 4 points for an eagle. The alternative of this is 1 point for a bogey or 1 over par and no score if 2 or more over par. More info on saving shots with a distance finder. The round continues with the benefit of any player being unable to score on a hole can pick their ball up and after their playing partners have putted out continue onto the next hole. This not only makes the game more enjoyable by relieving some of the stress but also helps to speed up play and so avoid frustration for all. What is the Meaning of Albatross in Golf?